Those of you out there of a certain age will remember Taito’s Operation Wolf and it’s two player sequel Operation Thunderbolt. In an arcade they were great hulking machines with a plastic machine pistol mounted on a pivot that let you gun down nondescript bad guys as they scrolled past you on the screen. 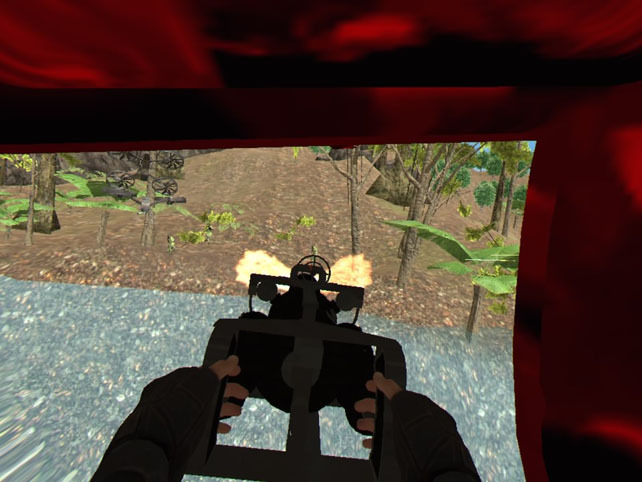 Pulling the trigger made the pop up enemies disappear and threw a jolt of recoil up your arm, whilst a press of the base mounted red button would hurl a grenade into the distance and wipe out most of what was attacking you. At the time it was revolutionary and always one the most popular machines in the arcades. It appeared on home computers but couldn’t recreate the cabinet feel with keys and a joystick. 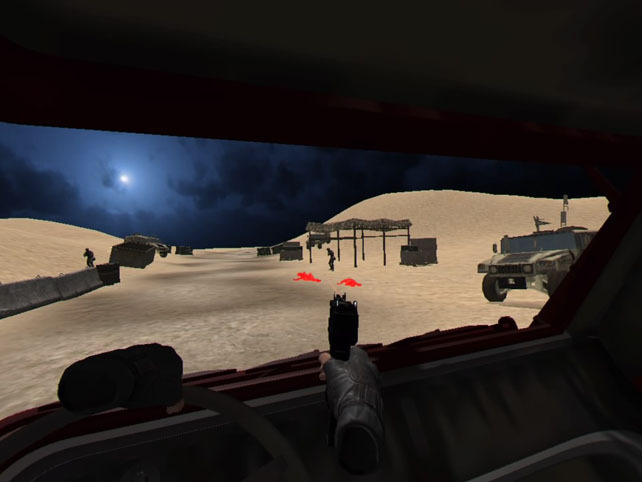 Fast forward 30 years and Operation Warcade arrives as a VR game that lets you relive that experience as a homage to the originals, as well as adding a few new features that just aren’t possible in the real world. 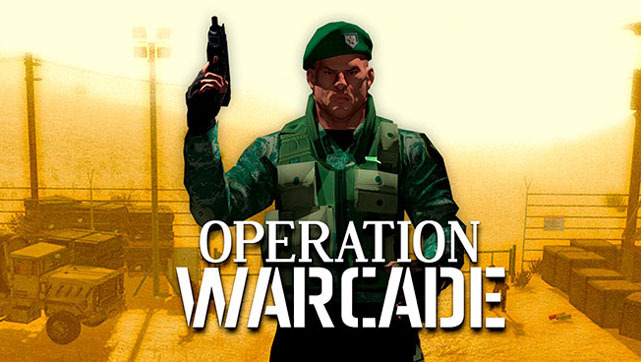 Unlike the inspiration behind Operation Warcade, there is no story here, it’s all about grabbing that gun and shooting anything that moves in front of the display. Don’t think that this is just an arcade cabinet in your VR headset though, the presentation goes further than that and has you both observing from the outside and taking part from within. It does label itself the “immersive version” after all. Selecting a mission – which unlock based on the number of stars earned from performing specific actions – drops you on the far left of a stage looking at a massive version of the arcade display… one that you can peer into the depths of the “off screen” parts if you need to. 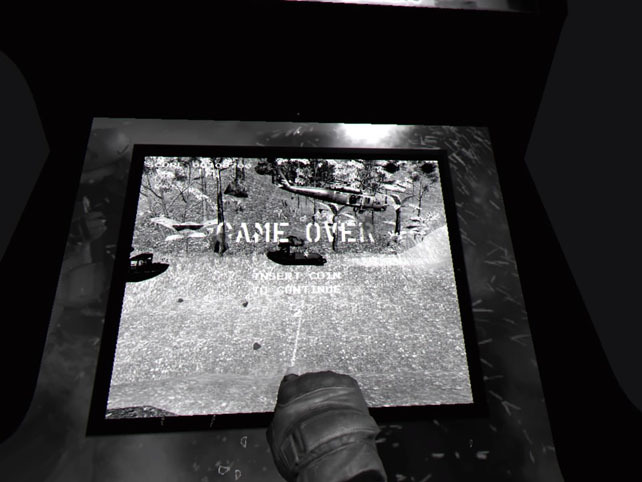 Equipped with an Uzi in your right hand and a grenade in your left, the objectives are simply kill everything that shoots at you as the camera pans to the right. Using Move controllers the weapons are independent so you can aim and fire with either hand, and that comes into its own with some of the bonus firearms later on. The Aim Controller and standard DualShock are also supported, with each offering slightly modified schemes. Using the Aim Controller is the most authentic feeling, yet I found the Move’s to be more manageable (for the most part). Completing bonus objectives like getting a set number of headshots or explosive kills rewards you with stars which contribute to unlocking another mission and game modifiers, and with 6 missions across 6 stages and varying challenges for each stage, there’s quite a lot to go at. On the face of it you might think this is a one trick pony and that after a couple of goes there’s nothing much more to see, but that wouldn’t really give you the true feeling of the game. It’s USP is the immersion sections where you’re drawn into the game and take on a challenge within the environment. These range from fixed guns to explosive arrow firing, and even to helicopter or jet flying, and offer up a really nice twist on what’s taking place. There are typically 3 per mission and are optional, but will mean missing out on some of the highlights of the game if skipped. It’s not all nostalgic delight though and a heavy pair of rose tinted glasses should be warn under your VR goggles if you’re looking for crisp, sharp and detailed graphics. Everything is functional and does what it’s supposed to, but it’s not a pretty game. It doesn’t have to be perfect given the scenarios that are playing out, but you could call it ugly at times. Having said that, it’s very smooth and mostly responsive – the flying sections are terrible to control and I couldn’t even get the helicopter off the ground at one point – yet it manages quite a bit of charm as things progress. Get to grips with the star based progression, and that they’re the only things that are important to do, and there opens up a small puzzle element in figuring out the best way to achieve them. Continues seem limitless so failure is only a problem when a challenge says retries aren’t allowed, otherwise it’s just shoot to continue from exactly where you were. The missions are also relatively short and once additional capabilities start to unlock then there’s incentive to return to older levels and max out the progression. The weapons are quite well done, and give some variety beyond what I was expecting. The Uzi is the stock item, and dual wielding two of them is a lot of fun, but shotguns, sniper rifles, bows, knives, miniguns, rocket launchers, riot shields and even a gravity gun make appearances. Grenades also get special versions to torment the AI with fire, ice and anti-gravity. These definitely weren’t in the 80’s game I remember. Operation Warcade brings a modern take with the firepower and knows how to make them all distinctly different. There’s no hot swapping available though, each one is usually time or ammo limited from the point you spot it and shoot it on the screen. Of course, enemies shoot back and standard grunts will pick away at your health for as long as you let them. 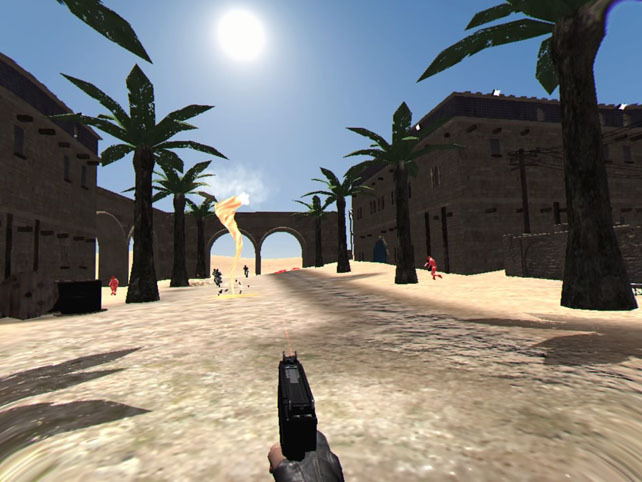 Bigger enemies or weapons will telegraph damage with bullet time speed projectiles that can be shot out of the air, deflected with the Uzi back at the shooter, or simply dodged with some judicious ducking. It’s a bit like SUPERHOT in that respect and expect to get a bit of a work out in the later levels. 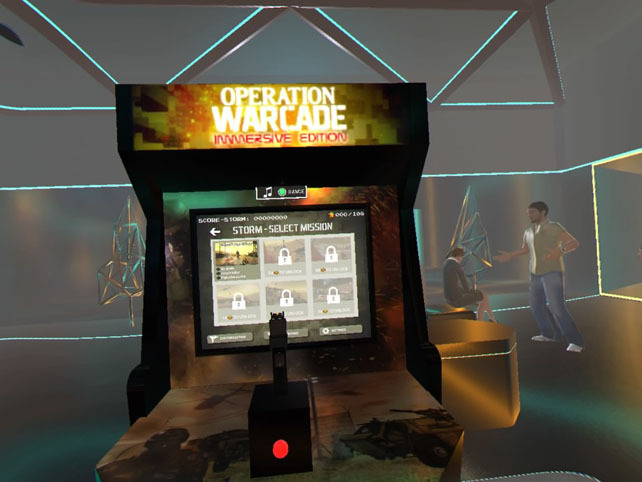 Operation Warcade isn’t a triple A VR title and comes from a small developer and publisher that quite clearly want to offer up the chance to relive one of the arcade eras biggest draws. The reminiscence factor is high from the outset, and it’s a bit like sitting down to watch The Expendables – it’s a loving attempt to bring that out of date genre back, uses updated ideas and mechanisms to make it work, and never takes itself too seriously. If you can overlook the graphics shortfall then there’s a few hours of good fun to be had here, getting lost in an arcade cabinet whilst the virtual crowds cheer you on. A PSVR review copy of Operation Warcade by Ivanovich Games was provided by the Perp Games PR team, and it’s available digitally now on PS4 and through Steam, and will be coming to retail later this year.